This morning T4rdis2 left the Cascades campsite that lies at the foot of Alpe d'Huez and headed off up one of the 6 valleys that are found in the Oisans region. We'd chosen valley Eau d'Olle, and to get to it we took the D1091 and then the D526 towards the town of Allemont. We'd picked this valley specifically because it climbed up the opposite side of the Col du Glandon to the one we'd previously tried to ride up last week, and it also could've potentially given us access to the Col de la Croix de Fer - but it wasn't to be - and I'll tell you why in a mo! 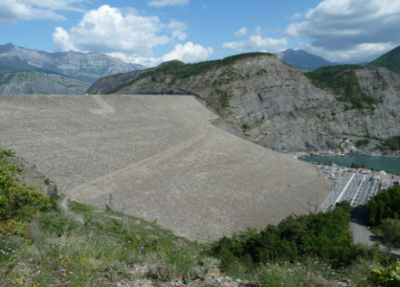 Our journey initially took the Varney's (us) past Lac du Verney - another hydro-electric man made lake with a big dam - and from there we begun to ascend up through the valley, initially gently on a nice forested road, but as we went further the Col became steeper! However, there were still lots of cyclists going for it, but some were definitely weaving about and looking quite exhausted, and as the signs indicated that sections of the 'hill' were 13% I was just very glad our work was being done by 4 wheels and not just 2!!! And then the hairpins started and our journey once again became one of the white knuckle kind - only room on the road for one and a half and a hard cliff face on one side to prevent us from moving over! To add to the mix there was also a fair bit of debris on the road - and at one stage we passed by a boulder in our path that had fallen from the shear cliff above and it must have been about 2 foot in diameter! T4rdis2 REALLY wanted to stay here! However, having said all that, it was another amazing drive, and eventually we reached what we thought would be another wild camp spot where we could spend the night. There were waterfalls to our rear, the lovely Lake de Grand Maison (Big House) in front of us, and all around high snow capped glaciers on the massifs of Belledonne and The Grandes Rousses. The only problem was our altitude was once again very high - probably approaching 2000 metres, and the rain that started to fall in the form of ice pellets was forecast to become heavy overnight. Also our only way down was back the way we'd come - therefore we needed to decide if we should stay put in our magnificent spot and risk having to drive down maybe in snow tomorrow, or should we just admire what we'd got for a short while and make our way down to a lower level and find somewhere else to spend the night! We were reluctantly sensible, and after a short work out to admire our surroundings we about turned and trundled back down - but even that required a few sharp intakes of breath when we met other vehicles hogging the white line coming the other way on blind bends. Our new target was a simple Aire in the town of Vaujany, but this required another climb - to a height of 1250 metres! However, the road was fairly good - so good in fact that a monster truck/crane led our way up the hill - so everything coming the other way either had to tuck in or back up! Eventually we settled in the towns small tarmaced free Aire which overlooks a high forested hillside were a waterfall falls in several torrents from a great height - beautiful! 2 days that turned out to be mostly driving days about 120 and 100 miles respectively - but Wednesday's in particular turned out to be quite breathtaking! More rain had been forecast for most of the day on Tuesday, but to be honest we didn't see much of it! As we left the Aire at Vaujany the sun was trying to shine, but as we descended down towards Lac Verney the rain started to fall, and that lasted for maybe an hour but after that the sun kept us company for most of the rest of the day! Sadly we were soon leaving the beautiful Romanche Valley and the Oisans Region behind but as we were heading for the N85 and Napoleon's Route (which had been recommended to us by some fellow travellers and is said to one of the top 10 drives in Europe) so we had high hopes of more fantastic vistas to come. 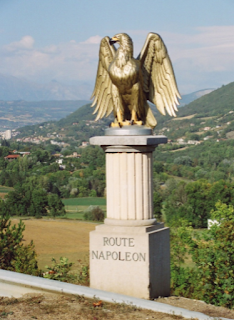 The current Route Napoleon first opened in 1932 and follows the way taken by Napoleon in 1815 on his march from Elba to Grenoble after his abdication. It runs for about 150 km, but today we only followed it for about a third of it's way - from Grenoble to the town of Gap. And to be honest we were a but underwhelmed! The road surface wasn't that good - John commented 'maybe it's the original that Napoleon put in'! 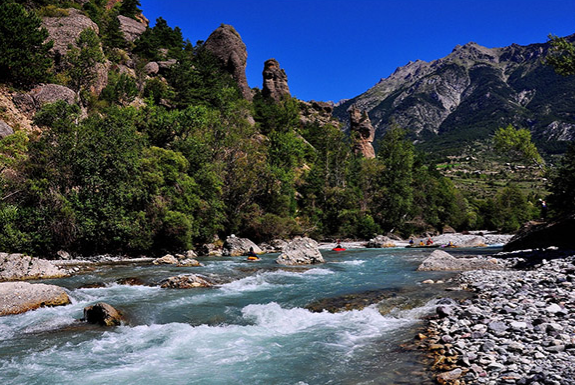 For us it just lacked WOW factor - possibly because we'd enjoyed such magnificent scenery in the Oisans Region! Having said that, I think it probably gets better further on than we travelled, and we're planning to do that part later in our tour, so fingers crossed we wont be disappointed. After about 50 miles we pulled over for our coffee stop - and WHOOPS we discovered we'd travelled all that way with our roof skylight open - luckily it was still in T4rdis2's possession! 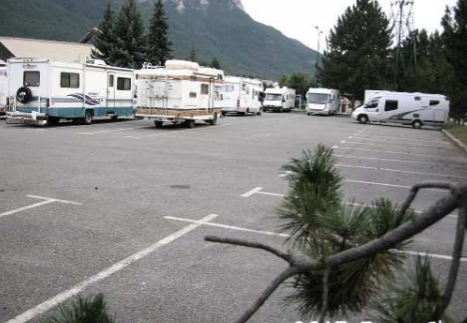 Then once we got going again - with all our orifices firmly shut - it was a stop off at Gap for fuel and LPG gas before we continued on our way and found ourselves in the Ubaye Valley. The valley passes more towering mountain peaks and is about 60 kms long, and it is here that the Poncon Lake can be found. This massive expanse of water is the second largest artificial lake in Europe, and the Dam that holds it in check is the biggest Earth dam in Europe! Here we also found signs identifying the road as 'The Route de la Fruite' and I'm fairly sure that must have had something to do with the myriads of orchards, vineyards and greenhouses that lined the sides of the roads. Eventually we pulled into a quaint little Aire in the village of La Breole, and after our regulation cuppa we decided we'd have a 'stroll' back to have another look at Lac de Serre Poncon! This turned out to be about a 5 mile hike along rugged steep stoney trails but our high vantage point provided amazing views. The only problem was the gradient of some of the paths - you'd think by now we'd be used to steep hills, but we'd only got our trainers on and there were plenty of 'rolling stones', especially on the down hill sections that tried to upend us/me! But we did get back safe and sound and a good walk at the end of a long days drive was just what we needed! And the view to our right! 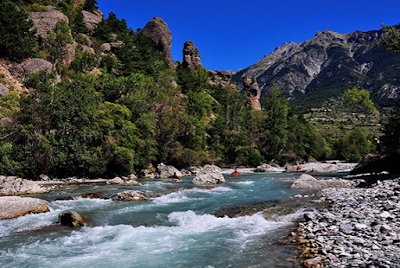 Our planned drive for Wednesday wasn't supposed to be so long - we were only aiming for an Aire at Briancon from where we planned to cycle up the 10 sheepish miles of the Col d'Lzoard - but as often happens - Plan A was a dud, and as we didn't have a Plan B at that time so we quickly had to hatch one out! But before that Wednesday's journey started with another long twisty climb that took us up to the opposite side of the Lac de Poncon, and for our trouble we were rewarded with more dazzling lake views under clear blue skies😎. Then we followed the lake side for many miles until we reached the resort town of Savines-le-Lac, and from there the Lake waters receded behind us but we still had the company of the tumbling River Durance which provides several areas of white water for canoeists and lots of parking spots - one of which we picked for our coffee break. right so we moved on! Once we got going again we were eventually tippled out into the town of Briancon, and after a quick stock up at Aldi we followed Mrs Snoopy's instructions that led us to the town's Aire - but oh dear! It was nothing more than a car park, and a scruffy one at that. There were several other old vans that seemed to have been parked for quite a while, and on an adjacent area there was what looked like a gypsy encampment. We just took one look at each other and it almost didn't need saying - 'we're not stopping here'! However, by this time it was 2pm and we were hungry, so while we incubated Plan B we scoffed our lunch. And in a way it was probably a good job we did! The climb from Briancon to the top was quite gentle and would undoubtedly have been a lovely ride, but by going up in the van we were able to park and climb up another huge mound to an orientation area from where we had 360 degree views of all the high mountain peaks and glaciers that surround the Col - and we wouldn't have been able to do that if we'd had our bikes with us! After we'd drank it all in we set off on our journey down the other side - all 20 miles of it on narrow vertiguous roads but luckily we didn't meet much traffic coming the other way! Apparently this part of the 'hill' is called the Casse Deserte - its an area of barren scree slopes punctuated by huge rock pillars that seemed to change colour as our angle changed with the twists of the road. And once we were down off the Col the tortuousness of our route continued to challenge my excellent chauffeur! The road almost buried itself in the deep Guil Gorge where more shear cliffs reared up on both sides, and where rough long tunnels were hewn out of solid rock. The Gorge is also the home of white water rafting on a river by the same name - there are some fantastic pics of it in full spate if you click here! The canyon like valley continued for several miles, but once we could see daylight again our journey was far from complete! Now we were very near the bottom of the heavily forested lower slopes of the Col de Vars, so once again T4rdis2 had to put on crampons and start up another very steep climb which was facilitated by numerous hairpins that came in very quick succession. After 15 miles of constant uphilling we finally arrived in the top settlement of Vars les Claux at 1850 metres (there are 2 more Vars villages further down), and from there we only had a couple more corners to go around until we reached our Aire which has fantastic views of Alpine lodges and, more distantly, more mountain tops and glaciers. However, we're once again at an altitude of about 2000 metres so thermals might be in order! Also, on the way up we'd become a bit concerned when we heard a loud popping noise - twice! It seemed the change in altitude had caused pressure to increase in a crisp bags and they had exploded on the shelf - oh well - it gave us a good excuse to eat them! Before I tell you about our day I need to tell you about the wonderful news we received last night! Adam, Vicky and Jack are expecting a brand new little person into their family and the chap on the right is deliver him or her at the end of February. 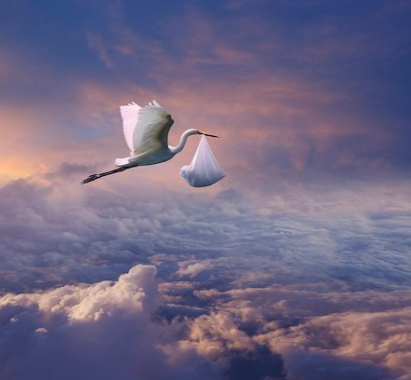 We're really chuffed for them and looking forward to the arrival of our 4th grandchild. For us the day dawned warm and sunny, but the start and end of it had a very definite cold nip - when I crawled out of bed the thermometer was only registering 6 degrees - so I very quickly put the heating and the kettle on, and then crawled back in while things warmed up! Anyway, the warming up bit didn't take long, and by the time we were ready to go out walking the sun had got his hat on and had already been playing for a while 😎! Today our target was the summit of the Col de Vars which has been frequently used in the Tour de France - and while we were out we saw plenty of cyclists trying to replicate the victories that have been achieved there! However, we didn't follow the road, instead we followed part of the Longueur trail which tracks through green scrubby fields nearly all the way to the top! Here we mostly found peace and tranquillity - that is if you could blot out the occasional roar of motorbikes that were heading for the summit! 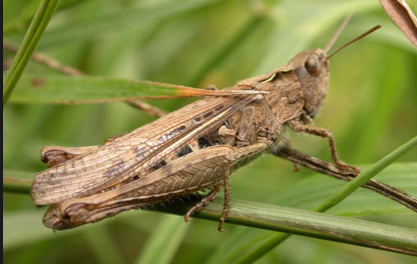 But that didn't happen to often, and for most of the way all we could hear was the drone of bees, the buzz of flies, the ding dong of cow bells and the chirping of millions of multicoloured crickets and grass hoppers - we had to be very careful where we were putting our great big size 8s and 10s! Once we got to the top our first requirement was feeding - maybe that was because we'd been walking steadily uphill for over 2 hours! But once our appetites had been sated we pottered around the plateau to see what was interesting. We found the Igloo Cafe and the monument on the right, and we were also treated to more fantastic views of glaciers that seemed to be all around us. We also learnt that the other side of the Col is called The Home of Damsels because apparently it is here that there is an area of rock formations called 'Demoiselles Coiffees'. These came about because hard stone was contained within a softer matrix and eventually the softer stone was washed away by rainwater and this left tall columns that looked like women with piled up hairdos! We didn't get to see them today, but when we leave we'll be descending on that side of the Col so hopefully there will be an opportunity for a quick photo shoot! And that's about it really, we pottered back to T4rdis2 via the same route, and then popped a casserole in our slow cooker for later! So all we've got left to do now is sit back and relax for the rest of our evening.